If you are a product of the 80’s, you get the title. Remember those epic Miller Lite commercials where arguments would ensue over “Tastes Great!” or “Less Filling!”? Well, I am here to launch a similar campaign for tarts over pies. Mmmhmm(Although, please read the disclaimer at the bottom…it’s rather important). Yep, this definitely is a fluff piece of journalism friends, so what’s new? Here’s the short list of reasons to make a tart over a pie…. The crust looks fancier and is fairly idiot proof (perfect for bakers like me who are challenged in the “make it look nice” department). See my tomato tart post for more proof! Needs less filling and thus the prep time is cut a bit. Needs less filling…no I haven’t been drinking—yet—stay with me here…less calories and fat per slice. Yippee! But please don’t think that this is a healthy or low-fat recipe…you would be grossly mistaken. Looks more sophisticated…gets, “oohs” and “aaahs” and “how did you do THAT? !” exclamations from guests. And finally…tarts are a handy little vehicle for summer fruits like berries and citrus and you don’t need a whole strawberry patch of berries to fill it up either. Pies tend to need huge quantities of berries which can be costly and annoying to hull and chop. With the scorching heat wave the West Coast has been having, this orange curd tart, with a nice layer of cold crisp bittersweet chocolate and topped with raspberries, was simply a smiley bite of cool and light brightness to nibble as we sat and chatted with friends. Honestly, this tart in particular is insanely good, especially if you like the combination of slightly bitter dark chocolate combined with tart orange flavor. I added just a dot of whipped cream and served it with a bowl of fresh raspberries last night, and there was not a single soul not cutting a sliver of “seconds” or licking their fork and plates clean. Needless to say, it got rave reviews and although it has two time consuming steps (pie crust and orange curd), you can take the easy way out and buy the Trader Joe’s or Whole Foods crusts which are wonderful and just focus on the curd. Putting it together is a snap and it will look and taste like a million bucks! Do not, under any circumstances substitute a tart for a pie on Thanksgiving…I will NOT be responsible for that kind of foolishness. This recipe makes a single crust pie so double it for a top crust pie. See my Heirloom Tomato Tart post for crust pics and more details. I actually made a single batch of this curd first, and then decided I wanted a thicker layer of curd so I made it again. Here is the 1.5 version. To make the crust: IMPORTANT, Start with really cold butter and chop it up into little 1/8 inch cubes. I usually cut the stick of butter vertically down the middle and then flip it and cut vertically again. Cut it into little cubes from that point. Place dry ingredients, flour through salt, into the bowl of a food processor. Whir it a couple of times to combine the dry ingredients. Then I add the butter, a few cubes at a time, down the chute, whirring in between. Drop ice cubes into a liquid measuring cup and measure a little over 1/3 c. of cold water in it. Strain out the ice after a couple of minutes and make sure you are left with 1/3 c. water. Add the vinegar to the water and pour the water mixture into the processor, a little at a time, pulsing in between. Pulse a few times until it looks mixed but there are still pea sized butter pieces in the mixture. If you are doing this by hand, you can either use a pastry blending utensil or your hands. Hands really work quite well because you don’t have the danger of over mixing. Just keep breaking up the butter between your fingers and incorporate all of the ingredients. If you over mix with the processor, it makes for a tougher crust. 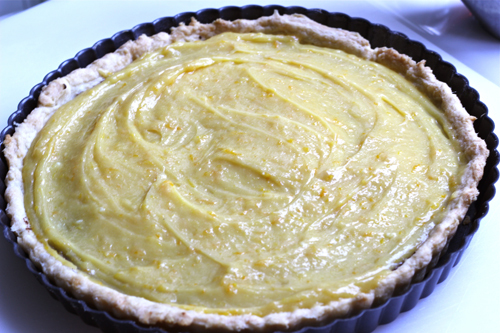 The coldness of the butter and water help make your crust flakier and so does leaving the butter in pea sized pieces. The butter pieces will create air pockets in your crust. Now dump out your mixture onto a floured pastry board. It will still be in pieces so don’t freak out…it will be a little dry and crumbly but you just need to mush it together to form a thick disk. If it won’t come together, you can add a tablespoon of water on the crumbles of dough and mold it in until you can get it to form a disk. The worst thing you can do here is add too much water. The dough should not come together easily, and should never be wet or sticky like batter or bread dough. It takes a little work to pat it and get it to shape into a disk. After it is formed into a disk shape, wrap it in plastic wrap and place it in a ziploc bag in the fridge for at least an hour (two is ideal!). This again is a great trick to flaky pie crust. Now make the curd while you have the crust refrigerating: In a heavy duty medium-large sized pot (not a stock pot though), add the egg yolks. Make sure to separate eggs in a separate dish first so if you make one mistake you don’t ruin the pot of egg yolks. Add the sugar, zest and lemon and orange juices. Whisk together with a wire whisk over medium-high heat. Whisk constantly until the mixture is smooth and liquid-y and then switch to a wooden spoon. Stir frequently, scraping the bottom and sides of the pot. Curd can burn easily or curdle. The trick is to stir often and turn down the heat to medium once you have a little simmer going (about 5-10 minutes after you began). Once you have a simmer, stir constantly, turn down to medium and cook for another two minutes until thickened. If it’s not terribly thick, that is OK, it will refrigerate and get thicker. Once it is thickened, take it off the burner and stir in the butter—only one large pat of butter (maybe a table spoon) at a time—stirring all of the butter in and add the salt making sure mixture is thoroughly combined. If you ended up with bits of solidified egg, push the curd through a strainer. Refrigerate for an hour or two. After the crust has refrigerated, heat your oven to 400 degrees F. and roll the dough out on an amply floured pastry board. The trick to rolling out dough is not to over work it. This will help your crust remain flaky. Roll forwards once then backwards once and then left and right and repeat until it is rolled out about an inch larger than your tart pan. I use a pairing knife to trim a 1/2 inch off my entire circumference to get a nice smooth edge. 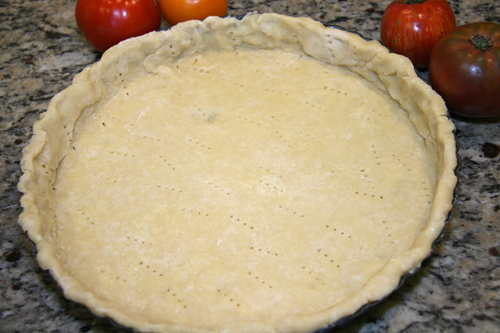 Gently lift your dough and place it into the tart pan leaving a little dough hanging over the top a bit. Use your fingers to gently press the dough into the ridges on the side of the pan. Push the excess dough over the top edge to cut it off. The tart pan is a little sharp and the dough will cut through it and then you just remove the excess so the dough fits exactly to the pan’s edge when finished. Poke the bottom and sides of the dough with tines of a fork. Gently. 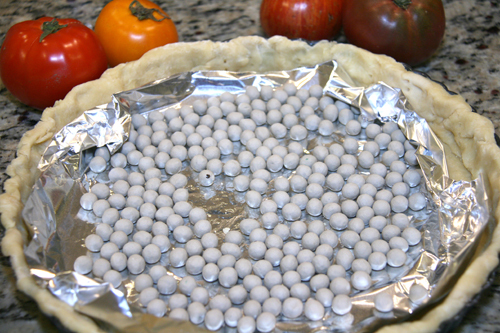 Cut a square of foil that will fit into the bottom of the tart pan and either fill it with pie weights or dried beans. Make sure to make the foil into a little saucer so the dried beans or weights won’t spill out onto the crust. Pic from my tomato tart that might help you. Bake with the pie weights in for about 10 minutes and then remove the foil with and the weights. Bake another 8 minutes without the weights or until slightly golden. Cool the crust completely. Melt your chocolate in a microwave safe bowl for one minute. Stir and then heat for one more minute. 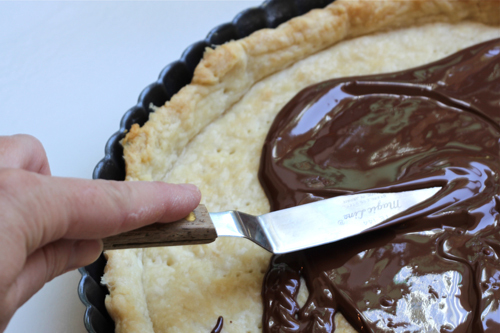 Pour the chocolate over the cooled crust and spread with a spatula or butter knife. 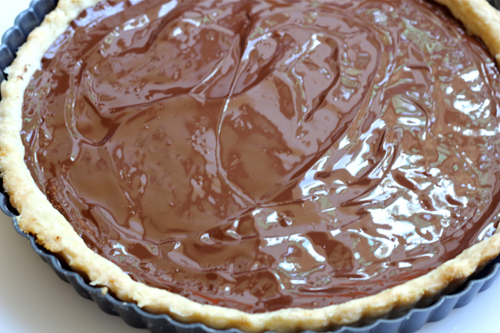 Refrigerate the pie crust with the chocolate for an hour. Once it is finished and the chocolate is cold and hard, scoop the curd over the chocolate and spread with a spatula. When ready to serve, top with dots of whipped cream and raspberries. Serve cold. I agree about tarts. Much fancier and impressive than a pie but you must have pie at Thanksgiving. This looks so wonderful! OMG! This looks so delicious! YUM! Hey tart for Thanks giving sounds pretty good to me 😉 Orange and chocolate are best friends and I know your tart is gonna taste awesome!! You lost me earlier than you might have imagined. I actually read that you were trying to convince us of the superiority of tarts to peas. (As much as I like vegetables, I’d go for tarts too.) I think I need to start getting more sleep. Beautiful tart! Love that combination of orange with chocolate. I’d like a tart or a pie, no complaints from me. Geni, your tart looks to die for! 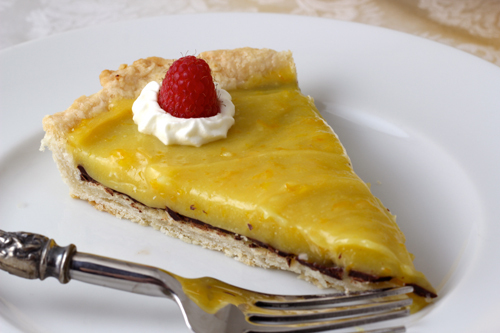 I really love the combo of orange curd and chocolate. Simply irresistible! Geni, that is GORGEOUS!!! I LOVE the picture of the single piece, so you can see the layer of chocolate!! And I literally LOL’d when I read the “BIG HUGE Disclaimer”!! Awesome! Great job on the tart. I still have yet to make one and have never had orange curd. Lemon and lime, yes, but no orange. I think I may be living in the dark ages. Thank you for gently reminding me of my mistake Lynn! YOU ARE AWESOME! 🙂 Tastes GREAT! You must try orange curd! I had never either until now…and it’s so yummy. Really, who doesn’t like a good tart!! I mean pies have there place in the world, so wholesome and yes, so perfect for Thanksgiving. Tarts are naughtly and nice….that chocolate filling with orange looks so creamy and naughty, but just a thin slice to make it nice 🙂 You did good on this one Geni, would love to be sharing a slice with you! You know how I am about chocolate Geni :). I am so loving this tart. I don’t even think I would share if someone asked me too LOL. That’s bad lol. lOL! I love the disclaimer and the shot of the chocolate on the bottom of the tart, This looks beyond beyond delicious!Might have to slap my mama! Southern lingo! LOL! Love your disclaimer. 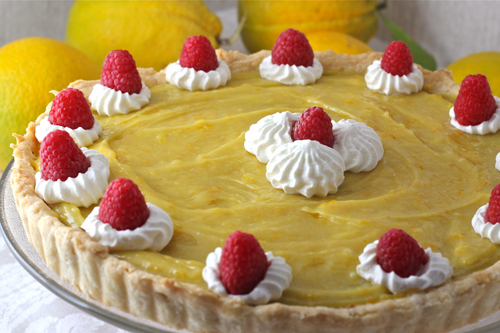 A tart on Thanksgiving is unimaginable! So tarts over pies huh? I’m torn. I do so love them both. I have to agree though – I love the look of a tart. They turn out so pretty and the little ones are just adorable. I’m definitely intrigued by the orange curd too. That sounds really good! Lol, your disclaimer is funny. This sounds delicious! Of course, it would be a strange thing for me not to fall in love with a recipe that includes dark chocolate. I love everything about your pie Geni! it is simply perfect! Now who do I invite over so that I can have an excuse to make this? YUM, I can’t wait to try this recipe! Hi Geni. This looks great and I am generally a tart lover more than a pie lover. You are so right about the quantity of soft fruit needed for a pie! What size tart pan did you use for this? It looks like a pretty large one. Thank you. Not sure about the size Amy…I will definitely check this when I get home and let you know. Thanks for your comments and question.